But many Americans have a difficult time cooking turkey. Despite their fine moral fiber, turkeys have a reputation for being among the trickiest of birds to prepare. They're big and bulky, and cooking turkey to a safe temperature can easily dry out the meat. Techniques like brining and spatchcocking—essentially snapping the turkey’s spine in order to lay it flat—are best left to advanced chefs. So how can holiday hosts cook turkey to everyone’s satisfaction? Undercooking a turkey can be problematic, particularly if you’d prefer not to serve up a Petri dish of Salmonella to guests. The bacteria that causes food poisoning and all its unpleasant symptoms is commonly found in poultry and has even led to a recent 35-state outbreak of illness due to contaminated raw turkey products that were apparently mishandled by consumers. The good news? Cooking turkey to an internal temperature of 165°F will kill any germs lurking inside. If you bought your turkey frozen, let it thaw breast-side up for four days in your refrigerator. (A good rule of thumb is one day for every four pounds of weight.) Place the bird in a pan and put it on the bottom shelf so no juices leak on to other shelves or into food. Once it’s thawed, you can consider an additional step, and one that might make for a juicier bird. Rather than brine the entire turkey—which allows it to soak up saltwater to retain more moisture during cooking—you can opt to moisten the meat with a 1:1 salt and sugar mixture under the skin. This accomplishes a few things. By adding salt to the meat, you’re going to let the meat retain more moisture than it would normally. (Cooking effectively squeezes water from muscle tissue, wringing the bird of its natural moisture.) By leaving it uncovered in the fridge, you’re letting the skin get a little dry. That, Crosby says, can encourage the Maillard reaction, a chemical response to heat in excess of 300 degrees that transforms amino acids and sugar, resulting in a tasty brown skin. Once your bird is ready for roasting, Smith advises you to place the bird on a flat, shallow pan with a rack that raises it 2 or 3 inches. “The rack lets airflow get around the bottom,” she says. If you don’t have a flat rack, you can use carrots, celery, or even rolled tin foil to give the turkey a little boost off the pan. 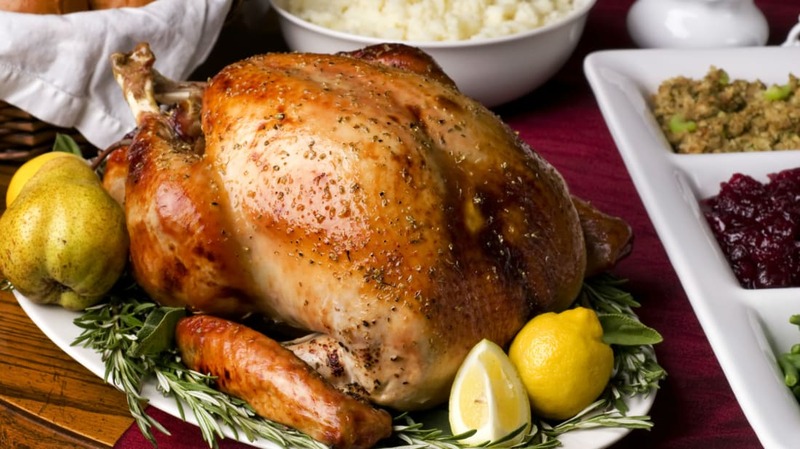 A 12- to 14-pound turkey will need to roast for roughly 3 hours at 350°F in order to cook thoroughly. But you’ll want to be sure by using a food thermometer. Both Smith and Crosby caution against trusting the disposable pop-up thermometers that come pre-inserted in some turkeys. Invest in a good oven-safe meat thermometer and plunge it right into the deepest space between the drumstick and thigh and get it to a safe 175 to 180 degrees. (The USDA's Food Safety and Inspection Service recommends heating it to no less than 165 degrees.) “By that point, the breast will be over 180 degrees,” Crosby says. If you’ve stuffed the turkey—and roughly half of people do, according to Butterball research—make sure it’s cooked to a temperature of at least 165 degrees. Once your bird is done, let it sit out for 35 to 45 minutes. The turkey will retain enough heat that it won’t get cold (don't cover it with tin foil, because the crispy skin will get soggy). Instead, a cooling-off period allows the muscle fibers to reabsorb juices and the salt and sugar to bring out more of the flavor. When it’s time to put the leftovers away, be sure to keep slicing. Individual portions will cool down more quickly than if you shoved the entire bird into the fridge. Eat them within two or three days. If you want to keep it from drying out during reheating, Crosby suggests putting the meat into a covered baking dish with some vegetables, potatoes, or gravy and using the oven on low heat or a saucepan on the stovetop. “You’ll retain more moisture the slower you reheat it,” he says. Roasting isn’t the only approach, as some of your friends or family members may attest. In addition to the brutal triumph of spatchcocking, some people opt to deep-fry turkeys, grill them, or slice them up into pieces prior to cooking. There’s no wrong way, but roasting will give you the most predictable results. “Roasting is Butterball’s preferred method,” Smith says. “It consistently turns out a tender, juicy turkey.” Or, as Ben Franklin would say, a much more respectable bird.